Kirk (nee Quinn) (Cookstown). 7th February 2019. Vera (R.I.P). Beloved wife of Tony. Loving mother of Elaine (Donnelly), Cathy (Hurrell), Niall, Jacinta (Keegan), and Sarah (Cooke). Cherished daughter of the late John and Virginia (R.I.P). Dear sister of Frank (London), Sean, Kathleen (McCrory) (Gortin) and Anthony. St. Padre Pio Pray for Her. Funeral from her late residence 41 Church Street, Cookstown, BT80 8HT, on Saturday at 11.20 for 12.00 noon requiem mass in Church of the Holy Trinity, Cookstown. Burial afterwards in Forthill cemetery. Deeply regretted and sorrowfully missed by her loving husband, son, daughters, grandchildren, sons in-law, daughter in-law, sister, brothers, sisters in-law, brothers in-law, nieces, nephews, neighbours, friends and wider family circle. 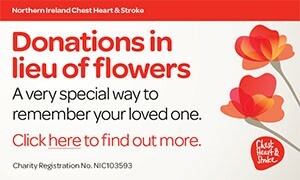 Family flowers only, donations in lieu if desired to Laurel House, Macmillan Cancer Care Unit, Antrim, co/ Niall A. Loughran Funeral Directors Cookstown. 028867 65454. I am sorry to tell you that Vera KIRK has passed away.